Do you ever feel that the grey dreary drizzle that characterizes winter in our beloved Missoula valley is crushing your running spirit? I do! Every winter, come late February or March, I get sick of the few icy trails I’ve been running over and over for 6-8 weeks that require a gymnast’s balance to navigate, as my favorite trails are either buried under hip deep snow or are more suited to a luge run than a tempo run. I enjoy the occasional post hole trip up to the beacon. But snow followed by rain followed by a grey day in the 40s followed by more grey and more drizzle brings me to the edge of my ability to maintain a positive attitude on my runs and in my daily life with my friends and colleagues. At that point, I need some sun and a few good runs on fresh, fun, dry trails. In the past couple of years, just as I’m about to lose my mind, I have packed a tee shirt, some shorts, a couple of gels and gone to the Allegiant Air website to find a flight to get the hell outta the cold and dreary and find some fun in the sun! This year, Rika Botzet and I booked a flight to Phoenix Mesa and headed to the beautiful red rocks and desert of Sedona. Often discount airlines offer their limited flights on awkward days--depart on a Thursday and return on a Tuesday--but the Phoenix/Mesa fight is Friday afternoon to Monday morning, making it incredibly convenient for the work week (you can work a few hours Friday morning and be back in the office by 11am on Monday). We arrived in Phoenix at 1:30 pm on Friday, collected our luggage, and were in the rental car headed to Sedona by 2pm. At 4:30 we were on a beautiful trail circumnavigating a gorgeous mesa on the south side of Sedona with amazing views in all directions. And, it was 70 degrees, dry, and I was getting a sunburn! Before describing the trails and the runs we did on Saturday and Sunday, let me digress and address what may be a misperception--that flying to a destination for a long weekend of running is super expensive and not accessible for the ordinary trail runner. Even with the limited selection of destinations and flights, Allegiant has affordable flights to Phoenix/Mesa, Las Vegas, and Oakland, all great winter running destinations. Each of these destinations are accessible for $150/person round trip or less for airfare, our car rental in Phoenix from Friday afternoon-Monday morning was $42 and options for lodging and dining can run from $20/day if you camp and buy some groceries, up to however much you want to spend on hotels and restaurants (I will say an outdoor pool and hot tub after a long sunny run in mid-March is a heavenly treat for this fish-belly pale Missoulian). Let me add that each of these destinations offers many incredible options for exploring new trails and towns: from Phoenix a runner could go to north to Sedona and explore the trails through the red rock formations or to Prescott to run in the mountain forests or head south to Tucson to explore the 50 mile Trail, Mt Lemon, and the whole Santa Catalina range (great camping at Catalina State Park right at the start of the 50 mile trail). Las Vegas has the cheapest flights and is probably the best jumping off place to the Grand Canyon, a four hour drive. Also consider St. George, Utah, located a little over an hour from Vegas featuring great trails not unlike Moab. Or give Zion National Park (check the forecast though as Zion is at elevation ad may be cold), a two hour drive. Oakland may be the ugly step sister of the three destinations as one might not think of northern California as a prime winter destination. But when I ran there in January 2013 it was sunny and in the high 50s and low sixties (perfect running weather) with many options and possibilities. Point Reyes National Seashore is probably my favorite but consider the redwoods in Muir State Park or Big Sur, too. A runner can get out of Missoula and have a great weekend of running in the sun for probably as little as $300/person. Digression over, back to Sedona. Prior to leaving Missoula, Rika and I did some research about the trails around Sedona as there are a number of great websites that have information on running and hiking in the area. 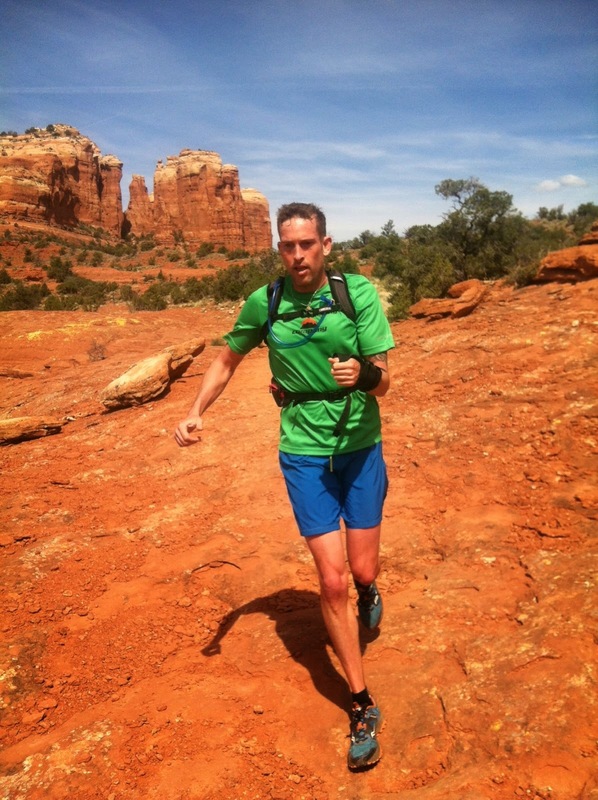 We discovered that Sedona has a cool specialty running store not unlike our beloved Runner’s Edge. After corresponding with the owner, Adam (a hilarious NY transplant and accomplished ultra-runner), over email we decided not to determine our running routes ahead of time but rather to go visit the Sedona Running Store and get some local knowledge while supporting the local running scene by purchasing an obscene number of Stinger Waffles. We arrived at the Sedona Running Company at 9:30 Saturday morning only to find the store opens at 10 on the weekends. No problem, we headed over to a cool little coffee shop. As we waited for our espressos, we spotted a guy wearing a bright Sedona Running Company tank. After a few minutes of chatting with this runner, not only did we have a great recommendation for our run for the day and for dinner, we had an invitation to join him and other locals for a run the next morning, and even to join them on a 30 mile run on a little know trail in the Grand Canyon in April! It never fails to impress me how friendly and open fellow runners are. After finishing our coffees and exchanging cell numbers with our new friend we headed to the Sedona Running Company to buy a map and our snacks for the day. A quick note on trail names and trailheads: there are so many trail running articles, blogs, etc. that provide names of trails and trailheads, directions to those trailheads, and descriptions and rankings of the trails. It’s great having that info so accessible. However there is also something great about doing a little leg work, talking to local folks, and finding an amazing trail on your own--maybe one only possible to find by striking a conversation with a bearded dude at the corner of the bar--that still holds a piece of trailrunning magic. 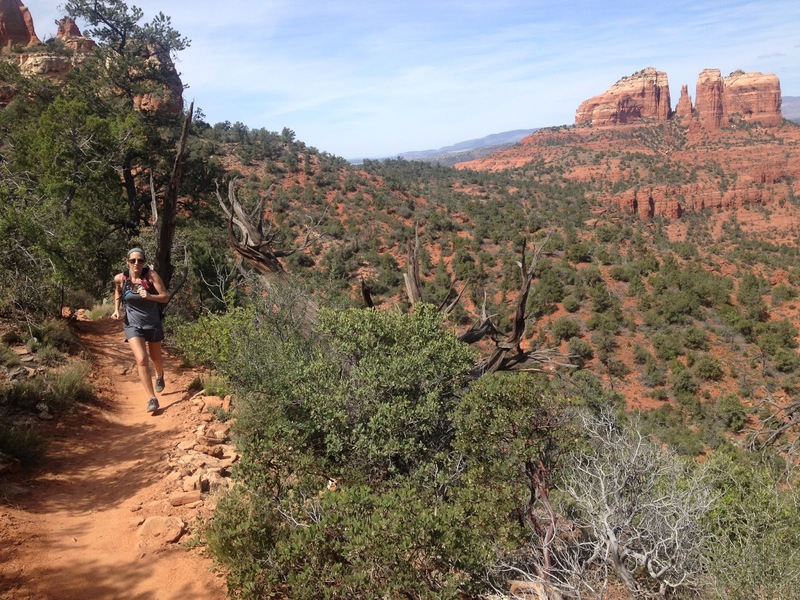 We highly recommend Sedona as a place to go running but we will leave readers the pleasure of finding their own trails by simply leaving the trails we ran nameless. Regarding trailheads, Sedona charges $5 to park at any of the numerous trailheads around town. We fully supported this as the trailhead parking lots were clean and orderly, all had clean restrooms, picnic areas, and proper garbage disposal containers. Further, the trailheads had excellent signage and a large map of the general area in trails in the vicinity. The trails were well maintained. The trail we chose was a 12 mile loop within a ten minute drive from Sedona proper. Not only was I surprised by how quickly you can get to the trails, but also how unique each trail is and how quickly the terrain and views change. We started our run on a sandstone single track lined with cactus (consider using the trailhead facilities, ouch! ), aloe plants, flowers and incredible views. As we gradually climbed to a saddle we enjoyed the sun on our backs and absorbed a much needed dose of Vitamin D. Once through the saddle we were momentarily stunned by the views but a short steep climb over slick rock landed us on our favorite part of the loop--a technical section under over-hanging rock--that contoured around, and eventually up to the top, of a huge red rock formation. This was an absolute joy to run on--happy, happy runners! Once on top the views were spectacular in all directions and we took advantage of some great photo ops and then meandered our way down a slab of slick rock to the last couple of miles of the trail, a rolling single track in a creek bed that had a ton of variety from slickrock spillovers with small pools of water to punchy little climbs up dusty arroyo banks to rocky ankle breaking sections. Even as we closed in on the trailhead and our car there were never too many people--there are so many trails and options from each trailhead that folks get pretty spread out. The run took us 3 hours with our frequent stops to enjoy the beauty and energy of the red rocks that encompassed us. We headed back to town for lunch and then to our hotel for a cool swim, a soak in the hot tub, and a sunny nap in a hammock, before heading out for our 6 mile sunset run. We were at a fresh trail head not a mile from “uptown” Sedona at 5pm. With the sun scheduled to set at 6:30, two serious looking climbs on what looked from the map to be a 6 mile loop combined with the extreme technical nature of the trails in Sedona and the insane scenery causing frequent photo stops, we were concerned about making it around before dark. The run started with a nice half-mile section that was both flat and comparatively non-technical, making it a perfect warm up for the climb up to the top of a unique grassy mesa. The climb was steep and of moderate length with several super cool sections of cascading red rock staircases. As you climb, you can’t see the top of the Mesa because it hides between several large, high, dramatic redrock formations rising two to three thousand feet. The result is when you crest the climb and the trail curls around a small juniper, you are unexpectedly greeted by an expanse of flat grassy tabletop disappearing into the distance, the dry yellow brown grass like small waves flowing peacefully towards the wilderness, mountains and rock formations, north of Sedona. It looks infinite. You can run atop the Mesa for miles (and we plan to go back and do just that) but after maybe half a mile we took a trail veering back to the south that gradually brought us back down and around the mountain. We had a pretty good pace going and we thoroughly enjoyed the changing landscape and setting sun--this trail had a completely different feel and look than our morning run. One section took us through a forest of small trees that appeared to have silver shimmering leaves. Further down the trail we ran by a large sinkhole named “Devil’s Kitchen.” Since I am writing this it’s obvious I didn’t fall in, which is good because Rick wasn’t carrying his probe. We finished the run about 15 minutes before it was dark and headed to town where we enjoyed an amazing dinner and a glass of wine at a local Mexican restaurant. What a fantastic day! Sunday morning was another beautiful sunny day and we couldn’t wait to get on the trails. After another stop at our favorite Sedona coffee shop we were on our way to tackle a 12 mile loop that would take us up high and provide great views of several of the area’s most famous formations as well as allow us to circumnavigate one of the famous formations, a portion of the trail along the beautiful Oak Creek. There are few things as special and magical as running along a flowing creek in the middle of a desert. We began the run at a trailhead at the base of a large massif, a formation maybe 2,000 feet high and three miles long and we started running…up. The climb was actually pretty gradual but quite technical. As a result we played leap frog with a group of friendly mountain bikers, passing them on the technical sections and getting passed in turn whenever the trail smoothed out. The most challenging part of the run was not stopping at every turn in the trail to take in the spectacular new view and take more photos! The trail switch-backed up the massif about two thirds of the way to the top then contoured narrowly along the side much like the High Line trail in Glacier Park. When we came to the north end of the Massif, just as the trail dropped sharply down to the valley and across towards the creek, we met up with our mountain biking friends for one last set of pictures and then headed in separate directions. The piece of trail connecting this contouring high trail on the Massif with the trail along the creek was probably the most fun section of trail of the trip: all down, cutting back and forth across smooth red slickrock with occasional sections where the trail would pour down off of the slickrock onto the sandy hillside in such a steep, eroded, and crazy way that there would be double black diamond caution signs. This all added up to a super fun couple miles of cruising of the massif and across the desert towards Oak Creek. We ran two loops around two smaller rock formations of about 3 miles each before reaching the shade of the cottonwoods along Oak Creek and running along in the cool shadows sandwiched between the creek and the giant cathedral of a redrock formation. Finally we climbed out of the creek bottom and ran up the redrock formation circumnavigating it back to a connector trail and to our car. The run was beautiful, varied, warm, dry, challenging enough but not so hard as to be more of a workout than a scenic run--the perfect way to end our Arizona running and prepare to head home to Missoula. After lunch and before heading back to Phoenix we found a large rim of redrock heated by the sun, in a beautiful quiet spot at the head of a deep brushy canyon. Feeling the physical need to soak up just a last little bit of sun and the spiritual need to have a slow, quiet connection with the desert, to feel the rock, and the blue sky, and the lizards--we lay down and spent an hour (it could have been two) quiet, nearly motionless absorbing the sun, the light desert breeze, the peace of the vastness of the desert country, and the revitalizing energy of the redrock. In Sedona, the running is great, particularly in mid-winter when it is so tough to keep good running juju in Missoula. But Sedona has more than just great running. It has rejuvenating energy that radiates from the beauty and drama of the landscape.